The capital of India is a bustling metropolis full of must-see landmarks and cultural attractions. New Delhi actually forms a small part of Delhi itself, setting the modern district apart from the traditional areas. This city was designed by a British architect and today, you can see the heavy influence of European style throughout the winding streets. Apart from the interesting architecture and modern buildings, New Delhi is also a vibrant and lively city full of fun family attractions, historical sites and fantastic shopping districts. If you’re in New Delhi on a whirlwind trip, here’s everything you need to see in two days. Start your two-day trip with a visit to The National Museum. Here, you’ll learn all about New Delhi’s history and the fascinating heritage of India, starting from the pre-historic era all the way through to modern times. The museum holds around 200,000 pieces of artwork, spanning over 5,000 years. Established in 1949, this museum is one of the largest in India and can be found on the corner of Janoath and Maulana Azad Road. It’s open 10am to 5pm every day, except for Mondays, when it’s closed. It’s a great way to begin your trip and immerse yourself in New Delhi’s history. If you’ve got kids travelling along with you, or if you’re just an animal lover yourself, make sure you visit The National Zoological Park on one of your two days. The park spans over 176 acres and includes a massive range of India’s most beloved animals, from hippos to giraffes and jaguars. The National Zoological Park is more than just a zoo; it’s also making great strides in the field of conservation. The breeding programme is designed to keep wild cats and rare animals from becoming extinct, in particular the royal Bengal tiger, Asiatic lion, Indian rhino and brow antlered deer. The park also features a 16th century citadel and a beautiful green island to explore. 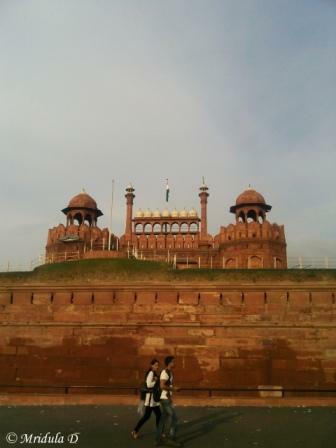 A quick trip to New Delhi wouldn’t be complete without a visit to Red Fort, in the historic district. 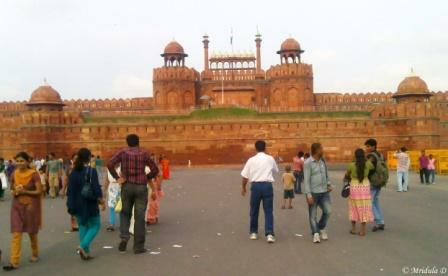 One of the top attractions in Delhi, the Red Fort is a great example of the power of the Munghal Emperor. The towering red sandstone structure was built in 1638, with massive walls and rooms, including the Drum House, Peal Mosque, Royal Baths, Palace of Colour and the Hall of Private Audiences. Today, you can walk through the rooms, taking in the stunning white marble and red sandstone surfaces. In the evening, the Red Fort comes alive with a dazzling sound and light show. Visiting the India Gate is definitely a must, when holidaying in New Delhi. You can see all of it in just one morning or afternoon, so it won’t take up a lot of your trip and it’s New Delhi’s largest memorial. The India Gate is dedicated to the 82,000 soldiers who lost their lives serving in the combined British and Indian army in the First World War. The gate itself looks similar to Paris’‘ Arc de Triomphe, with lights that illuminate it when the sun goes down. The memorial holds the names of 13,300 commonwealth servicemen, as well as a shrine built underneath, in 1971, to commemorate the Unknown Solider. It’s a sombre visit, but an essential one for paying your respects to those who died for our freedom. For an authentic New Delhi shopping experience, head to Chandi Chowk. This vibrant market is always in full swing, with huge crowds and delicious street food on offer via the numerous stalls. If you’re looking for a more chilled out alternative, the Select Citywalk is a modern mall with luxury international brands selling clothing, shoes, electronics and more. 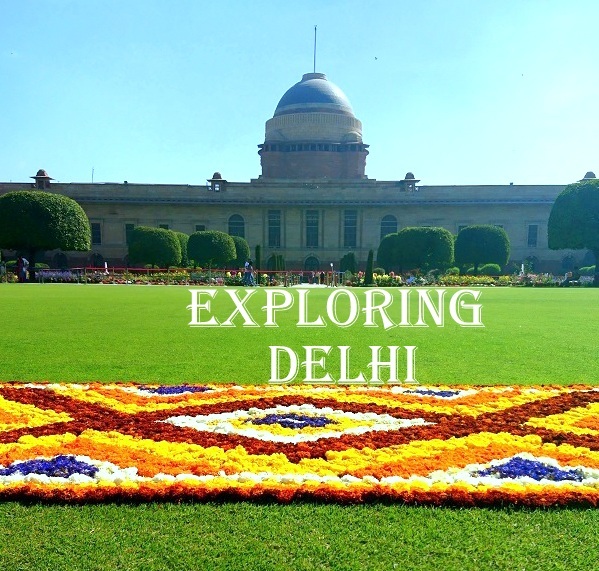 To learn more about what to do on a two-day trip to New Delhi, check out Expedia’s travel guide. 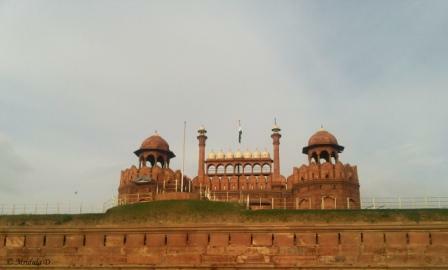 I have been living in the National Capital Region (NCR) now for almost a decade and yet this was my fist visit to the Red Fort Premises. And this one was also not planned. I had to get my camera serviced. Earlier it used to happen on the command prompt. Both my nephews whom I refer to as Brat 1 and Brat 2 would be given a command to get it serviced and they would do so. Now Brat 1 is working and no longer living with us (even though he is in NCR) and Brat 2 is doing an internship in Dubai. He thankfully would be back in a month and would be with us at least for another year. So the command prompt will function for another year! So I had to get my camera serviced myself. I headed to Chandni Chowk and gave it in a small shop for repair. He initially said on which day would you like to collect it? I told him, today! He took some pity on me and said to come back in an hour. So, I had an hour to kill and I was finding the Chandni Chowk area too noisy and crowded. I just started walking towards the Red Fort area. It was around 5.30 pm so the light was good. I could see the Red Fort in the distance and I deiced to go near it. It was a pity as the SLR was given for servicing, so pictures had to be taken with the cell phone only. By the time I reached there I decided I was too tired to explore much. That was because I had gone before to apply for a UK visa at the Nehru place earlier in the day. So I just lazed around the main area, took a few pictures and then headed back to the camera repair shop. He had my camera ready. But the zoom lens repairing would take a few more days. The good part is the guy didn’t give me a scrap of paper in lieu of the SLR or the zoom lens. I hesitantly asked him if I need a receipt and he just waved me off, saying come back in an hour. I wonder how long this trust would last in general in India?